I’m always on a mission to find resources, ideas and books that inspire me to succeed. The world of small business is insanely diverse. And everyone has their own unique reasons for choosing self-employment. If one of your goals is to gain recognition in your niche, this book is for you. Inside, Daniel Priestley (@DanielPriestley) outlines a powerful strategy. A “Five-Step Sequence to becoming one of the most highly valued and highly paid people in your industry”. I picked up this book up the business show. I started thumbing through it on the homeward train. Before I knew it, I was hooked… The ideas just resonated. I found myself taking notes, underlining key points and frantically brainstorming and capturing ideas the book dislodged. Inside his book, Priestley explains in detail how to achieve his five steps. The book is bite sized chunks, easy to read and packed with questions and activities designed to focus your motivation and push you on. It’s not just theory. It’s also a practical application of Priestley’s ideas. It all starts with your pitch. You’ve absolutely got to nail it and be convincing. What’s more you need to get specific, passionate and use your pitch to attract opportunities. Your pitch should capture your “Big Game”. And it must be so contagious others will bite your hand off to get involved. Give your pitch credibility and build your reputation by writing a book (or valuable articles). And before that scares you off, you can self-publish and you don’t have to write a best seller! The key is to become a published author because it immediately raises your profile. Next share your ideas. Make them accessible to a wider market through valuable downloads, CD products, eCourses etc. Aim to create something of value that helps you reach a wider market – and makes money whilst you sleep. Get “web famous” and build your personal brand. Make it clear you know your stuff when your name is Googled. In addition embrace social media to engage in conversations, interact and spread your message to a new audience. Priestley argues this is the critical key to achieving KPI status. You need to find people to work with who complement your ideas. You benefit because you gain access to a wider audience much quicker than you could alone. When you are a KPI, you will find great opportunities come your way”. p.160. Perhaps the idea of becoming a KPI is appealing but you’re unsure where your niche lies. Daniel’s advice to is step back and appreciate what’s there already. Your niche doesn’t have to be something entirely new. Instead re-visit what you’ve done in your past and get clear on how your experiences have brought you to the present day. Next embrace the niche knowledge you already possess, and set out to package it so it becomes valuable to others. Approached this way, even past jobs or interests that on the surface have little relevance to your current business suddenly have something to offer. The concept of a “micro business” really excites me. And in my opinion, the time is right for niche companies to make an impact – even on a global scene. Social media conversations, online shopping and the ability to market to a niche has made it very feasible for a micro business to achieve skyrocketing success. You just need to equip yourself with the tools, ideas and determination to make it happen. And for me Daniel Priestley nails the difference. A following is not enough. If you want to be a thought leader in your niche, you also need to develop influence. So if your aim is to become a KPI in your field, see if this book resonates with you too. Who and what inspires you in your business? Please leave a comment and let me know. I loved this book too. It is so right that you need to have that micro niche, within your general niche and then you get on and make yourself a KPI within that. Its so important for all of us especially when it comes to PR as it really helps you raise your profile within your market which will mean the press will come to you!! Thanks for telling us all about it! Hi Georgina, great article. Thank you for taking the time to write it for us to benefit from. I was given the book by a friend last week as he felt I would find it interesting… I didn’t just find it interesting, I found it eye opening. I haven’t been able to put it down. I have been in business for 2 years now and only after reading the book did my ‘micro niche’ hit me in the face… brilliant book, a must read for anybody in business. Great article and I have to agree that this book is essential for any business owner looking to get KPI status within their niche, which is easy when you know the 5 steps as outlined here. 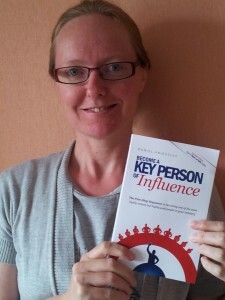 Looking forward to meeting Daniel at the KPI event London event in June and to finishing the rest of the book!